ANOTHER rattle, for a coworker just coming back from maternity leave. 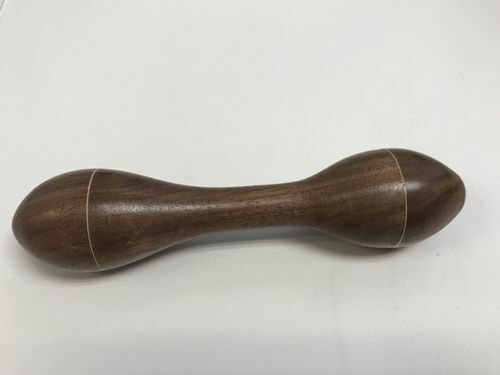 Walnut with maple veneer between the handle and end caps. Does anyone have a suggestion for gripping one fully turned end of this form so I can properly shape and finish the second end? I thought it might fit a set of chuck jaws, but none of the jaws I have fit. I might have to make something, as I see more rattles in my future, and it gets frustrating to have one nicely shaped and sanded end, and one janky end that tried to shape on the belt sander and by hand with sand paper.